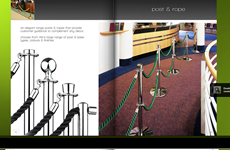 If you have a single line queuing environment or want to optimise the space you have available, then install a barrier system and single line call forward system to reduce walk-aways by up to 96%, speed queue flow and improve service times by 30%. Save money and improve operational efficiencies by targeting resources to specific periods of the day. Eliminate wrong queue frustrations by serving customers in the order they arrive; the fairest and fastest way. Retail crime costs the industry £1 billion annually don’t be a victim to this statistic – single line call forward systems help reduce ‘sweethearting’ a form of employee theft – where a customer can choose who they are served by, usually a friend who only scans the lower value items in their basket. The system ensures that customers are served by the first available till position and the cashier choice is automatically random. Any attempt by a customer to give up their place in the queue to wait for a particular cashier to become available then appears more obvious. Add value to your single line queue and encourage impulse purchases by integrating In-Queue Merchandising. For further information on how Tensator’s single line electronic call forward systems can transform your queuing environment and add to your bottom line profits, contact us via email on enquiries@atir.com.au.